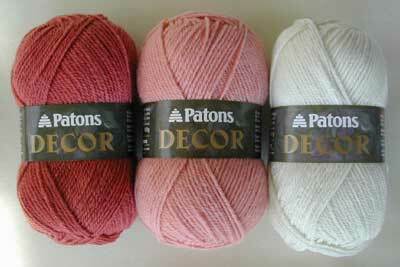 My Patons Decor yarn has arrived. It’s for the 63 Easy-To-Crochet Pattern Stitches Combine to Make an Heirloom Afghan. I chose coralberry, pale coralberry, and aran. The coralberry and aran are from the Beehive Wool Shop and the pale coralberry is from Herrschners (because Beehive was out of that color). Beehive was running a special for a free sheep pin with an order of $75 or more. Isn’t he cute? I was so lucky to get it, because I kept putting off ordering the yarn, and when I finally did order, I got the last pin! They are handmade by Wendy of WW Creations on Pender Island, British Columbia. After my first post about this afghan, some folks expressed interest in crocheting it, too. So, I’ve decided to try to get a crochet along going. Find out more about it on my 63 Squares Crochet Along page and at Crochetville. Donna, I love the yarn you bought for the afghan. The sheep pin is adorable, and I love Sheepie. That is the cutest thing! Donna, you can count me in. I still need to find the book. Your colors are gorgeous. I never used to be a pink/red person, but now it seems those are my favorite things to work with. I know I’ve seen it at Michaels for ages, and I’ll bet Walmart carries it too. Walmart will be my first stopping point, if I can’t find it here in the house! I’m so tempted to start the 63 squares crochetalong because of that cute button! I must finish my pillowghan first. I love sheepie, too! Such a cutie. I love your color choices, by the way. Very pretty. Oooh, yes Vera, this would be a great stash buster project! You may find this book available locally at craft stores (and save on postage) ’cause it seems to be everywhere. I got mine at Hancock Fabrics. Thank you, Julie! I never used to be a pink/red person either. I’m still not, really, but I have to learn that there are colors other than blue. LOL And the coralberry colors have a slight bit of a dusty orange look in them (thus the coral part, I guess), especially compared to Patons’ country pink/pale country pink. Thank you, Pam and Tiff! Choosing colors is usually so difficult for me. But these just jumped out at me as the right ones. Tiff, there will be plenty of time for you to do the 63 squares after your pillowghan. I would like to keep it going as long as there is interest, rather than making it a thing where everybody has to start at the same time. This looks like a stash buster project to me! I used to have this book, but I cannot find it. Of course as soon as I order another one, the one I have will pop up. If I can’t find it by the end of the week, I’ll order it from Maggie’s Crochet.